Chung Khoon decided to join us to Cambodia despite Ciline couldn’t join us. So I helped him to buy a ADNS Superior Night class ticket with sleeper berth. The ADNS class sleeper ticket fare costs RM 37 for upper berth and RM 42 for lower berth, and it the cheapest sleeper available from KTM for the ride between Kuala Lumpur and Johor Bahru. San Yew just told me that Sim Joo has found her old passport, which previously thought was lost, and going to renew the passport on Monday. So they should be able to make the trip to Cambodia. That’s a great news, as the new Malaysia passport usually is can be made and ready for collection in 1 day. Who is the Rich Fellows? We I booked the AirAsia tickets to Cambodia, I have wondered if how many of the persons committed will not be able to make the trip to waste and donate the money to Air Asia. At the time, I believe it there should be some people who won’t be able to go together to Cambodia. Now Chung Khoon and Ciline have said they have to waste the free tickets from AirAsia (free tickets still need airport tax and other charges, which I believe, if not used, will go to Air Asia pocket), due to Ciline just found a new job in Singapore and was unable to apply for any leave. As our flight to Siem Reap is at 10 am on 9th August (Wednesday), so a few of us from Singapore have to go to Kuala Lumpur the night before, or take the expensive flight from Singapore to KL on Wednesday morning, as there is not suitably timed flight from Johor Bahru (JB airport is just an hour from Singapore) to KLIA airport. I have thought of buying the train tickets from Johor Bahru (Tips: Depart from Singapore will need to pay in Singapore Dollars at the same price tag, which converted as more than double expensive at current exchange rate. And beside, JB KTM train station is conveniently located just right outside from Malaysia custom building) a few months back. Bus is the last option as we will arrive in KL at the wee hour. After dragging for more than a month and persistent reminders, I finally bought the train tickets for Jennifer’s couple, Wei Heng and me today, while I was in Johor Bahru. We bought the cheapest class with seat only at RM 20 per person. It’s the best value way to travel between Singapore and Kuala Lumpur if you can sleep with the aircraft economy class-like seat, which is not so reclinable. Cherry blossom is one of the main attraction to Japan in Spring season. But Japan is not the only place to watch the beautiful scenery of cherry blossom. Able to view full blossom of cherry blossom trees while travelling to South Korea, the country that getting more visits and more popular on the radar to tourists due to overwhelming popularity of Korean dramas and movies such as Jewel in the Palace (Dae Jang Geum), Full House, Winter Sonata and etc, must be a welcome added bonus. We went to Hong Kong on Friday, it’s weekdays that had less visitors and ferry passengers. So we went through immigration and custom clearance very fast with almost no queue. After passing the ticket checking booth, it’s a short distance walk to the ferry pier to board the catamarans. 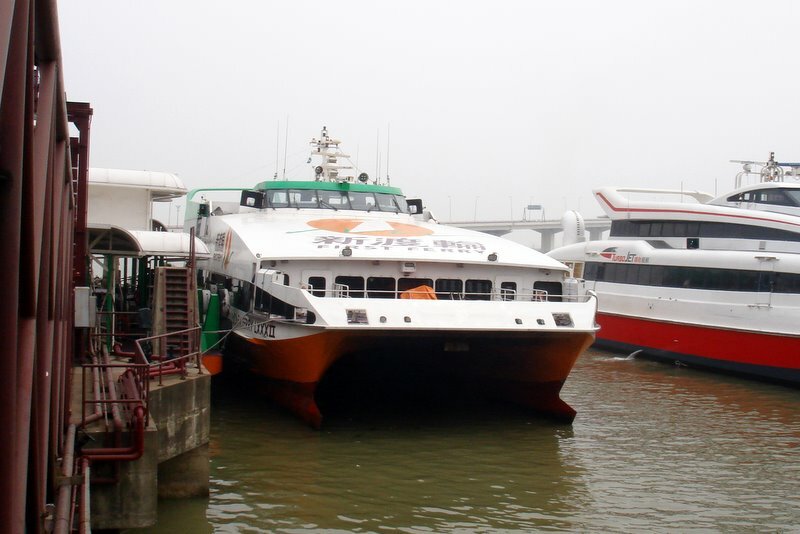 Hong Kong is separated by 65km of sea water from Macau, and currently there are currently 2 companies that operates high-speed jetfoil ferry and catamaran transport service between Hong Kong and Macau. 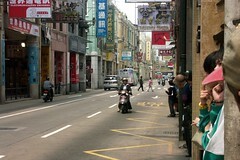 The travel times between Hong Kong and Macau normally takes around 1 hour. 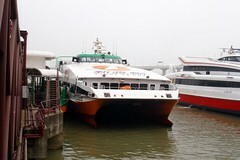 Turbojet operates three types of vessels from the ferry terminal in Macau to Shun Tak Centre in Hong Kong, and vice versa. Economy class fare from Macau to Hong Kong costs HK$142 on weekdays, HK$154 on weekends or public holidays and HK$176 for night services (from 6.15pm to 6.30am). The ferry tickets from Hong Kong to Macau costs HK$4 cheaper. Beside, Turbojet also offers Senior (age 60 or above) and children (age below 12) HK$15 off per ticket. The services are almost 24 hours, except the gap between 4am and 6am. I went back to Central Hotel after walking for a while, and my family had finished packing their luggage. We’re checking out from the hotel to go to Hong Kong now by ferry. The ladies that manned the reception during out checked out were very friendly, unlike the old guy during the midnight. As I mentioned about the Central Hotel, the ladies gave us clear direction on which bus to take to go to the Jetfoil Terminal, the main ferry terminal to Hong Kong, exchanged our Hong Kong notes to small coins to pay the fares, and even explained that we have to pay a MOP $0.50 more (actually was HKD 50 cents, as we didn’t have any Macau money), as they didn’t have 50 cents coins, and each ticket within Macau Peninsula costs MOP (or HKD) 2.50. The bus stop along Avenida de Almeida Ribeiro is just about less than 1 minute walk from Central Hotel. The bus stop has a sign board display the number of the buses that service along the road and their ply routes and destinations. Avenida de Almeida Ribeiro or more commonly known by local as San Ma Lo (New Street). There were not many vehicles on the road. 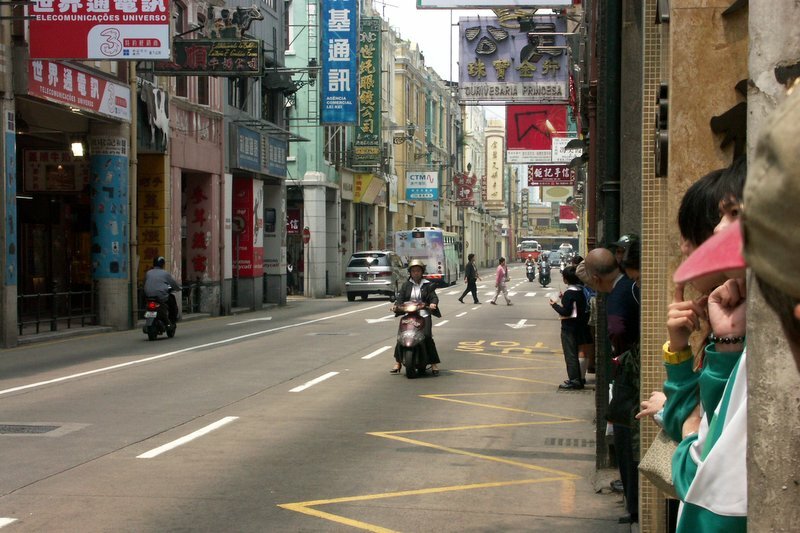 This may because what the taxi driver told us are true – that more Macanese walks instead of drives or rides due to the small size of Macau. 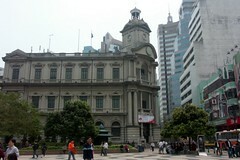 After lunch, my family went back to Central Hotel first while I went to Macau General Post Office – main post office in Macau with intention to post a postcard back to Singapore for me. 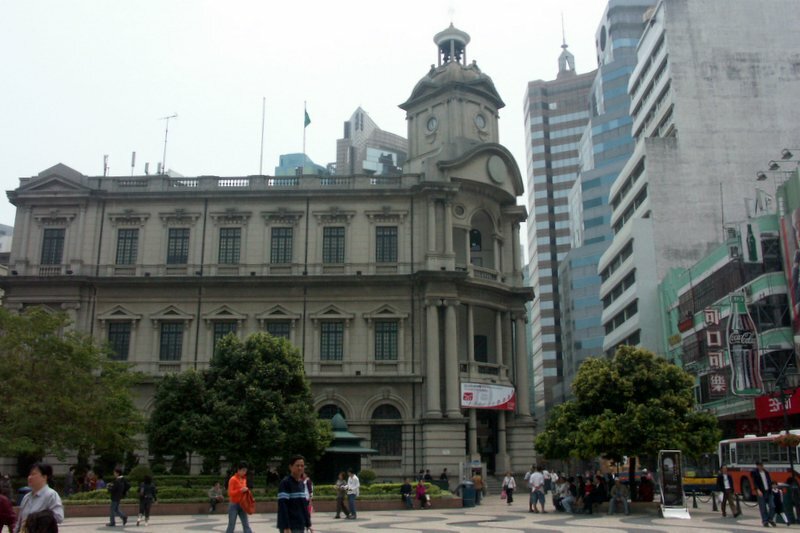 Correios de Macau, Macau’s postal system main post office is located at 126 Avenida de Almeida Ribeiro which just beside Largo do Senado.